The bond between sisters is more than those between friends. Sisters are always going to be there for you and they're always going to be your best friends. Show your sister how much she means to you by giving her Personalized Sister Gifts. 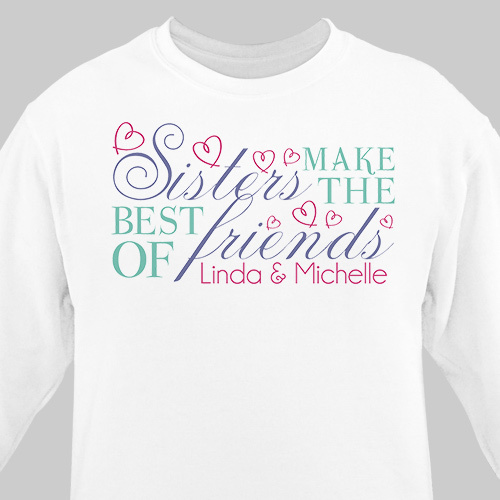 These Gifts for Sisters are printed on our premium white, pink and ash gray cotton/poly blend sweatshirt, machine washable in adult sizes S-3XL. Free personalization of up to 6 names is included. Great quality. First, it was shipped to me incorrectly. It had two different personalizations on one shirt. But, I phoned customer service who were as nice as can be and reordered a new shirt with the correct personalization, no questions asked. I got the corrected shirt within three business days, in time to ship to my sister for Christmas along with her other gifts. Additional Details Give one of our friendship sweatshirts to each one of your sisters as a special surprise. Whenever you wear it, you'll be reminded of the special bond that you all share. Remember: family over everything.